Can you imagine biting into a carrot grown in sea water? What about eating salt-water cabbage, beetroots and potatoes? These options probably haven’t crossed your mind yet. 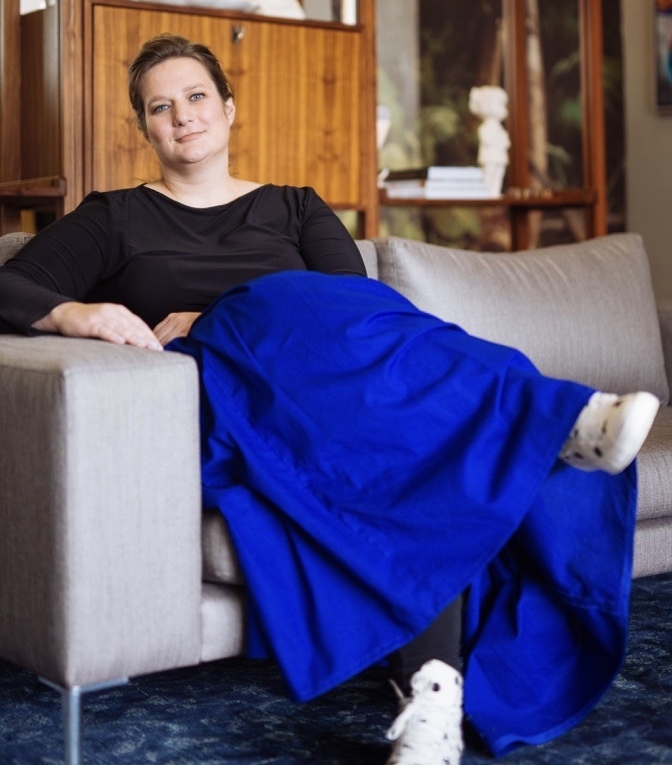 Nevermind, Hannerie Visser and her team at Studio H in Cape Town will lead you into the future. Studio H has been exploring the future of food: the how and what we might be eating if we become more efficient as resources become scarcer. 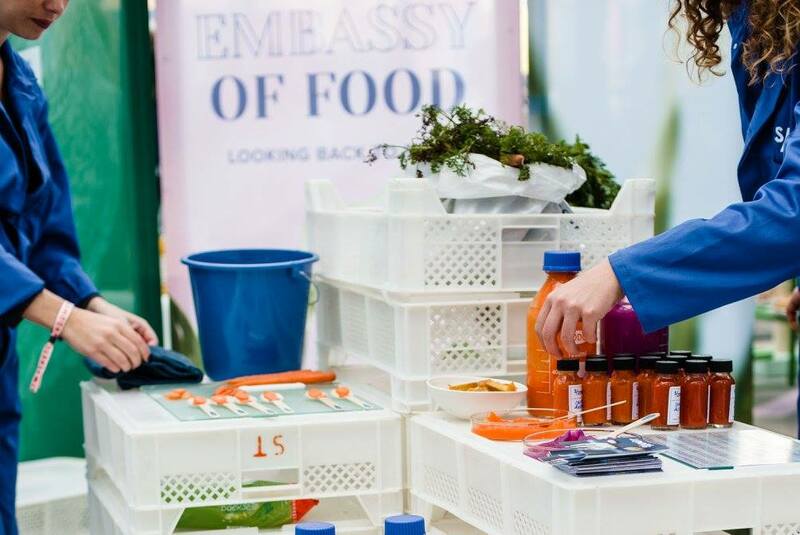 My first glimpse into this world of food design was at Hannerie’s carefully curated day-long event, Food Studio Conference, held in August last year to which she’d invited international and local speakers to talk about the work they do. 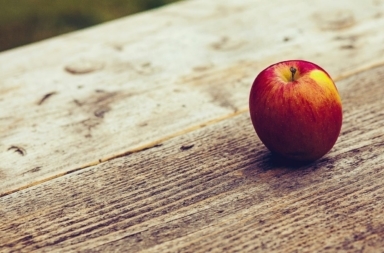 But first, what is food design? Hannerie explains that it is not about making pretty things or styling. “It’s about finding solutions for the future. It’s about looking at problems, like food waste and water scarcity, that threaten our food system and through design finding solutions to those problems.” At her studio, she says, they do ‘meaningful design’. Did you know that worldwide we waste 1.3 billion tonnes of food a year? Studio H was part of the team that conceptualized and built the magnificent Moet Chandon Christmas tree installed at the V&A Waterfront in Cape Town at the end of 2017. Empty champagne bottles, 1680 of them, were collected from across the country and carefully re-used to make a 10-metre-high tree by 15 people over 17 days. Studio H built the tree with ThingKing, a design-maker agency. LED lights, 15 300 of them, were used in 26 concentric rows to create the light. Interacting with social media messaging, the lights went on one at a (message) time. Waste is a big theme of the work Studio H does and food waste was a big topic of discussion at the August food conference where Dutch guest speaker, Ruby van den Broek, explained how the company she works for, Instock, saves food from ending up in a dump by turning it into delicious meals for their three Dutch restaurants. Did you know that worldwide we waste 1.3 billion tonnes of food a year? Another big theme of the work at Studio H is thinking about seawater agriculture. What crops are salt tolerant? And what can we do with the crops that will grow well under these conditions? An increasing water supply shortage and an increasing demand for water, caused by climate change and a growing population, are two factors we’re facing now and will be facing more of in the future. With almost 70% of the world’s fresh water used for irrigation, it’s clear the time has come to invest in using seawater for food production. Marije Vogelzang the food designer of the Dutch Institute of Food and Design invited Studio H to participate in the 2017 Dutch Design Week, the biggest design conference in the Europe. There, Hannerie says, “We presented a speculative project influenced by our water crisis and looked at what would happen if there was no more fresh water in the world”. For their S/Zout project, Studio H researched and found a farm in the Nertherlands, which for ten years has tested growing vegetables in seawater. “There are a few crops that survive in sea water, some in a dilution of sea water. Once we knew that carrots, cabbage, lettuce, strawberries, garlic, onion and tomatoes are salt tolerant we started working on a future food pantry,” says Hannerie. They approached chefs to design dishes and at the Design week, they showed a range of ketchups they made with Cape Town chef Ash Heeger. At their stand, they exhibited carrots grown in seawater in the Netherlands. The carrots “tasted very much like normal carrots with the small difference that they are a little bit sweeter. The plant compensates for the high salt content in the water by storing more sugar,” says Hannerie. 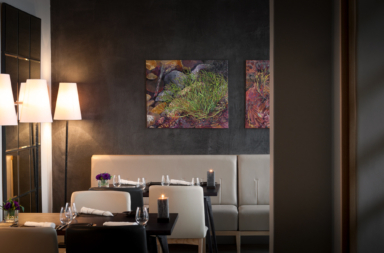 UPDATE: On the 24th of March Studio H will be hosting a waterless dinner for Earth Hour in partnership with Sun The Table Bay Hotel and the V&A Waterfront. The dinner is a platform to showcase how consumers can join the waterless food movement. It will also be incorporating low energy lighting solutions into the dinner, shining light on the The Table Bay and V&A Waterfront’s sustainability practices and initiatives. Tickets are limited. Book through Quicket. This is not to be missed. 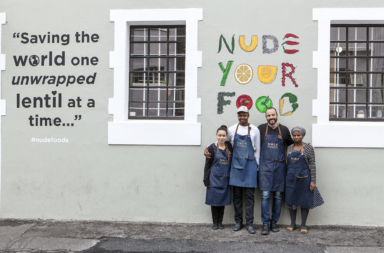 In January Hannerie and her team hosted a series of three pop-up waterless dinners in Cape Town. The dinners used using salt tolerant crops, inspired by the studio’s S/Zout project. There were only 87 tickets available in total, which is the number (in litres) of water one person is allowed to use per day in Cape Town, then (now we’re only using 50 litres per day!). All profits were donated to Veld and Sea.